1. Season onions with first measure of salt (1 teaspoon) and pepper (1/2 teaspoon). Cook on grill until charred. Reserve. garlic powder	 0 1/2 tsp. 2. In a large pot of olive oil. Over medium heat, sweat charred onions. Cook for 5 minutes. 3. Add V8® Vegetable Juice and garlic powder. Simmer for 20 minutes on low flame. 4. Add tomatoes. Continue to cook for 25 minutes. Add second listed measure of salt (1-1/2 teaspoons) and pepper (1/2 teaspoon). 5. 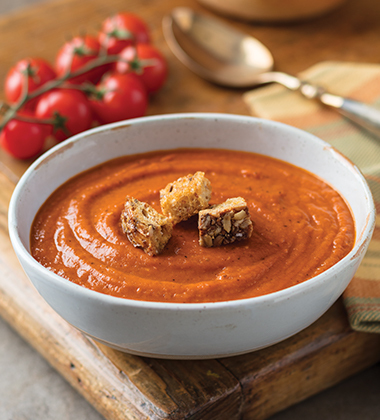 Using a blender, blend tomatoes white bread and garlic until very smooth. Add third listed measure of salt (1 teaspoon) and pepper (1/2 teaspoon). 6. In a small mixing bowl, combine sour cream, cilantro & lime juice until well incorporated. 7. To Serve: Using an 8-oz. ladle, portion 1 cup into soup bowl. Garnish with 2 teaspoons (#100 scoop) of lime cilantro sour cream.